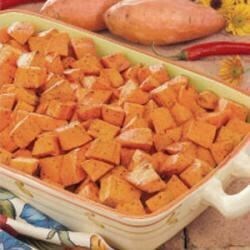 "My family fell in love with the combination of sweet and spicy in this potato side dish the very first time they tried it. It goes great with poultry...and looks so pretty on the dinner table. I try to serve it often. --Lynn Thomas London, Ontario"
In a large resealable plastic bag, toss sweet potatoes and oil. Add remaining ingredients; toss to coat. Transfer to a greased 11-in. x 7-in. x 2-in. baking dish. Bake, uncovered, at 400 degrees F for 40-45 minutes or until potatoes are tender, stirring every 15 minutes. It exceeding our expectations (even our 1 and 3 year old loved it). I used half of the brown sugar and put in a 1/2 tsp of curry powder instead of Cayenne (I was out of Cayenne). I absolutely loved these, I think next time, I will reduce the amount of oil and turn on the broiler for the last 5-10 minutes to make them crisp. Great side dish with just enough kick! I followed the recipe exactly and would not change a thing. I did line the baking dish w/ foil to make clean-up easier! Thanks for a super recipe!